If you are engaged or planning a wedding, you don’t want to miss out on this sweepstakes. I know how much winning this sweepstakes could mean to the lucky couple that wins it. With so many Americans struggling just to make ends meet, it’s hard to save up for the special day. I would hate to think that there are suitors out there ready to pop the “big question” who are holding out because they can’t afford the ring they think their partner deserves. In my day, you were happy just to be proposed to, it didn’t matter if you got a ring pop from a vending machine. There wasn’t a need for fancy venues, hundreds of guests, or a dress that cost as much as a year’s salary. You just had your immediate family meet at your local church, and then back to an aunt or uncle’s place for some finger foods over fold-up card tables. What mattered was your love for each other, not how the whole thing looked. But alas, those days are gone, and there is so much pressure on young couples today to have a wedding that can hold a candle to Beyonce and Jay-Zs. While I do find the wedding type shows entertaining, I worry that they put an unrealistic expectation in the minds of many brides-to-be. That’s why I think this is such a great giveaway. If you are the lucky winner, you’ll have one less major expense to worry about. 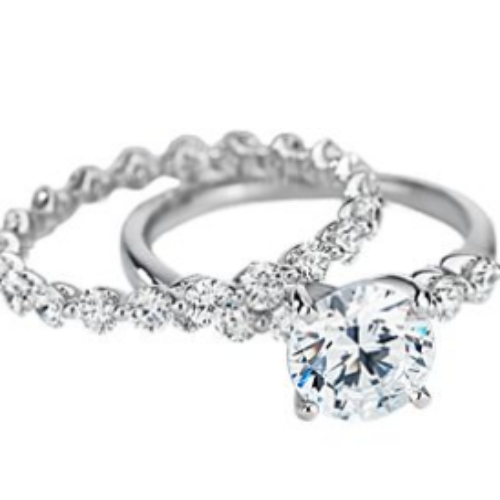 This $10,000 Blue Nile gift card could go a long way towards taming a “bridezilla”. Of course since it is a gift card, you could always use it for other jewelry from Blue Nile. Maybe you are renewing your vows or maybe you just want to buy something special for that special someone. I’m sending all the best of the luck in the world to my fans and subscribers that one of you may be the lucky winner. I would love to Win a Engagement Ring and Wedding Band for my wife of 57 years of marriage. A gift for the first granddaughter. I would really like to make my fiance the happiest person in the world, She made the whole world know we are going to get married and then i ruined the part that makes it official by making a bad financial choice, and it breaks my heart knowing what she must feel like, because social media has a huge impact in society today. Id really give my life to win this for her because her happiness means more to me than my life itself. After my husband left me and subjected me to a bankruptcy and foreclosure, I sold my wedding ring and engagement ring. I have regretted this decision and have dreamed for years about replacing them. Winning these rings would make that dream come true. I would also have something to hand down to my daughter when she gets married. Early on in our marriage,in the 1st year, which we know is the hardest adjustment period. I got mad and threw my rings in the woods. Now I am wearing rings that are sentimental. They were my husbands grandmothers rings and one is missing from the set. I would be a walking advertisement for the giveaway as I am a mail woman and many people cross my path everyday! Early on in our marriage,in the 1st year, which we know is the hardest adjustment period. I got mad and threw my rings in the woods and never found them. Now I am wearing rings that are sentimental. They were my husbands grandmothers rings and one is missing from the set. I would be a walking advertisement for the giveaway as I am a mail woman and many people cross my path everyday! Early on in our marriage,in the 1st year, which we know is the hardest adjustment period. I got mad and threw my rings in the woods and never found them. Now I am wearing rings that are sentimental. They were my husbands grandmothers rings and one is missing from the set. I would love to have my own set, and those are beautiful. I would be a walking advertisement for the giveaway as I am a mail woman and many people cross my path everyday! I need a wedding set. Early on in our marriage,in the 1st year, which we know is the hardest adjustment period. I got mad and threw my rings in the woods and never found them. Now I am wearing rings that are sentimental. They were my husbands grandmothers rings and one is missing from the set. I would love to have my own set, and those are beautiful. I would be a walking advertisement for the giveaway as I am a mail woman and many people cross my path everyday! WE WILL BE CELEBRATING OUR 30TH WEDDING ANNIVERSARY ON OCTOBER 21ST OF THIS YEAR AND WOULD LOVE TO REPLACE MY HUSBANDS LOST WEDDING BAND(LOST IT WHILE AT WORK AS A BURN UNIT NURSE)AND MIND WHICH NO LONGER FITS…IT HAS BEEN A MARRIAGE FILLED WITH A LOT OF UPS AND DOWNS(LOSS OF OUR FIRST BABY-A SON DUE TO PREMATURITY WITH COMPLICATIONS AT 1 WEEK OF AGE,OUR DAUGHTER BECOMING PARTIALLY DISABLED AS A RESULT OF CONTRACTING TRANSVERSE MYELITIS JUST BEFORE HER 15TH BIRTHDAY,HUSBAND BECOMING DISABLED 13 YEARS AGO IN A WORK-RELATED ACCIDENT AND MY HAVING 4 SURGERIES DUE TO A WORK RELATED ACCIDENT AS A RN AS WELL.IN RETROSPECT WE HAVE EACH OTHER WHICH IS THE GREATEST UP IN OUR MARRIAGE IN ADDITION TO OUR BEAUTIFUL DAUGHTER.THIS WOULD BE GREAT TO WIN!!! I would absolutely appreciate winning a engagementring! I would like to win an Engagement Ring & Wedding band. Never had an engagement ring. Better late than never..